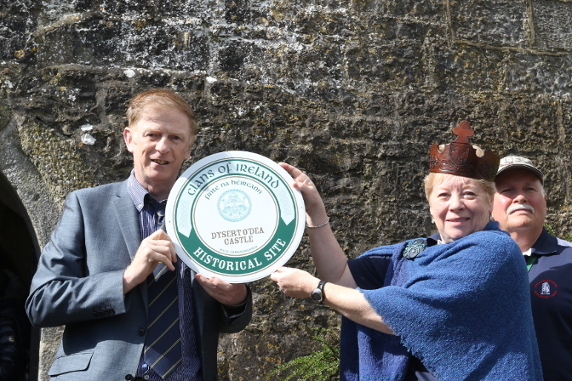 The inaugural Clans of Ireland Historical Site Plaque was unveiled at Dysert O'Dea Castle, Co. Clare, by Dan McGrath, Clans of Ireland Historical Sites Committee Chairman and Joan Koechig, Chieftain of the O'Dea Clan. The event coincided with the 10th International O'Dea Clan Gathering in nearby Ennis and the commemoration of 700th anniversary of the Battle of Dysert O'Dea. This is the first of a number of locations around the country which have been deemed Historical Sites. Plaques will be unveiled at a number of other sites over the next twelve months. This will be followed by the launch of a Historical Sites Trail. There was a large crowd present for the unveiling of the inaugural plaque, including several members of the O'Dea Clan from around the world, who had gathered in their ancestral county of Clare for the O'Dea Clan festival of heritage, genealogy and culture. Speaking at the unveiling of the plaque, Dan McGrath acknowledged the great work being carried out by Irish Clans, outlining the value of gatherings such as the O'Dea Clan Gathering in linking Ireland with its diaspora. He highlighted the tremendous efforts of the various clan committees around the country who host gatherings, the vast majority of the work being done on a voluntary basis. Before he ended, Mr McGrath said that he was 'delighted to unveil the plaque at Dysert O'Dea Castle on behalf of Clans of Ireland on such a special occasion, commemorating a key event in Irish history'.